NASA's New Horizons probe has finally made its way past distant Pluto, after a nine year voyage through the planetary zone of the solar system. I write this shortly after it passed the planet (surely Pluto will be elevated back to proper planetary status given the remarkable properties it's now known to exhibit? ), and the release of a new image released by NASA, taken at a distance of half a million miles (right (1)). It's early days to comment on what we're seeing here, particularly as there is the prospect of a huge amount of new data coming back to scientists from the distant probe over the next couple of months which will bring far greater clarity to the geophysical picture on display. But some of its features jump out at me straight away. "It clearly shows the dwarf planet's surprising Mars-like reddish hue, and the enigmatic heart-shaped feature on its surface that has already become Pluto's calling card on the internet... The dwarf planet's unusual colour has also enthralled scientists. Far from being a drab grey, as expected, it turns out to be salmon red. Experts believe the colour arises from the chemical action of sunlight generating red compounds in the atmosphere that then fall on the surface. As it turns out, Pluto reddening had been noticed from images of the planet taken by the Hubble Space Telescope. The red colour has become more dramatic over the last ten years than in previous decades, a change which is thought to be due to the solar wind stripping away hydrogen from the methane surface ices leaving dark, reddish organic compounds exposed (3). It's not the first time that red dwarf planets have been discovered in the outer solar system. Neptune's largest moon Triton is pink, and exhibits a retrograde orbit suggesting that it is a captured object (4), perhaps originating from the Kuiper Belt. The reddest of the known Kuiper Belt Objects is the enigmatic Sedna, which is second only to Mars itself in its redness. Sedna is remarkable for a number of things, the most bizarre being its highly elongated orbit which, according to planet hunter Dr Mike Brown, is clearly indicative of the dwarf world having been perturbed by a sizeable outside influence some time in the past (5). Compared to the rest of the planets in the solar system, Pluto's vast orbit is off-kilter and elliptical. Perhaps it too was perturbed by the same outside influence that Dr Brown mentions. So what makes this red colour appear on the surface of these distance worlds? Deposition of organic materials onto the surface (created by the sun's dim UV light working on the volatile compounds of the thin atmospheres) could be the reason, although it should be noted that this redness is certainly not common to all of these Trans-Neptunian Objects. Another factor might be high speed, collisional interactions, which in Sedna's case seems all the more possible given its highly eccentric orbit (6). It's now known that Pluto has an atmosphere of nitrogen, methane and carbon dioxide (2), which is perhaps thicker during its long perihelion passage than when it resides about a third as far away again at aphelion. 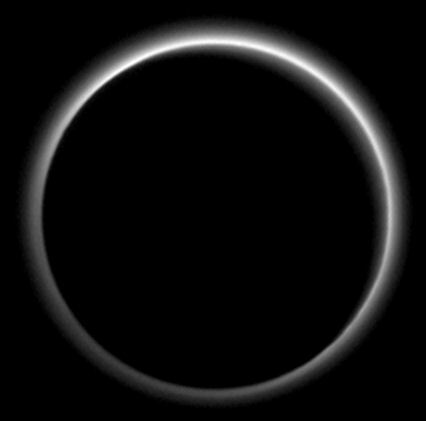 Truly remarkable images sent back from New Horizons on 23rd July show a backlit Pluto with hydrocarbon atmospheric hazes extending to about 80 miles above the planet's surface, significantly greater than scientists had anticipated (7). The new atmospheric data suggests the deposition of reddish organic materials (tholins) onto its surface, leading to its darker colour. 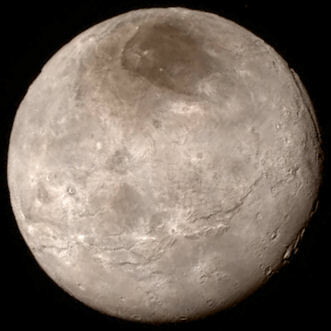 Also, the existence of the sizeable moon Charon strongly indicates a major collision between Pluto and another celestial body in the distant past. This collision may have placed Pluto into its eccentric orbit, or perhaps the same major external influence (a Dark Star way beyond Neptune? (8)) which perturbed Sedna so dramatically? Pluto has many more surprises up its sleeve, all of which point to a dramatic past. I think that its claim to be a proper planet has been greatly enhanced. There have also been hints of a sub-surface ocean. Pluto's companion Charon is relatively large for a moon - even more so than the Moon's relative size to the Earth (both might be consider binary planets). It likely formed following a catastrophic collision between Pluto and another cosmic body. This process served to heat Pluto's interior, enabling a liquid ocean to exist possibly to the current day (9). Such an ocean is likely to lie ~60 miles below the surface, however, and contain ammonia and salt impurities driving down its freezing point (10). So, the ice mountains likely arose from the water-ice bedrock below Pluto's surface, a layer which itself may cover a deeper aqueous ocean. Other areas of Pluto are covered in wide fields of glaciers flowing across the planet's surface. The intense cold at this distance from the Sun (minus 235C) means that these are highly unlikely to be made of water ice: the properties of water ice at this temperature which helped to form the rugged ice mountains don't lend themselves to malleable ice flowing across a surface. Instead, these glaciers are likely to consist of nitrogen, carbon monoxide and methane, and are likely still slowly flowing over Pluto's ancient craters today (14). Pluto's active features are thus providing insight into a multi-layered, complex world. Perhaps life, in the form of extremeophiles, might also exist deep within the planet, submerged in dark, warm oceans. 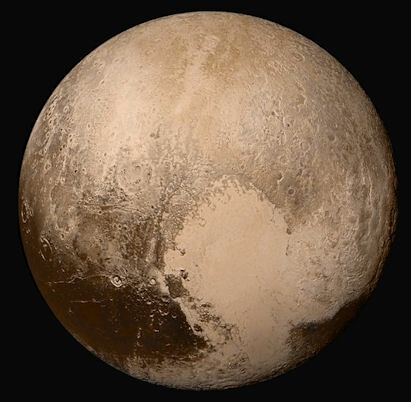 What is clear from all this is that Pluto is far from being a dead lump of frozen rock. The surprise here is that, unlike many of the outer solar system moons, Pluto is not in the vicinity of a gas or ice giant planet (which provide their moons with tidal warming, and immersion within a strong magnetic field). Nonetheless, it experiences internal processes, like tectonic and volcanic activity, which cause widespread re-surfacing. Its moon Charon played, and may still contribute a part in this. Charon's very existence most likely points to a previous catastrophic collision which created the moon, boiled Pluto's interior and set the consequent binary planet system onto its irregular orbital path. Pluto's almost perfect spherical shape indicates that at some point in its past it must have been spinning very quickly, likely as a result of the giant impact which led to the creation of Charon (14). Furthermore, Charon's orbit around Pluto is now fairly circular, pointing to a settling of its orbit over a long period of time. In this same way, Charon's tug on Pluto slowed its spin over time. So, the planetary collision which affected Pluto must have been a very long time ago. What caused it? Was it anything to do with Sedna's odd orbit, or that of the other so-called scattered disk objects beyond the regular Kuiper Belt? Are these distant cosmic footprints of catastrophism more evidence for the existence of a much larger body further out in the solar system? I think so. Clearly, the outer solar system continues to surprise everyone. It's a curious thing that this proposed formation of the Pluto/Charon planetary couple essentially mirrors that of the Earth/Moon coupling. What are the odds that two planets in the solar system both get whacked early on, forming massively over-sized moons? I would think the odds for this are pretty long, yet here we are. Perhaps this suggests that something else is going on which no one has yet guessed at. Either way, the occurrence of early catastrophism in the outer solar system is confirmed by these findings by the New Horizons probe, leading us towards a realisation that the previously bland modelling of the zone beyond Neptune is at odds with reality. Another important point for those considering the existence of Nibiru: Like Saturn's moon Enceladus, Pluto is now known to be far more active than theoretical models suggested. Scientists must now consider other mechanisms driving these kinds of active internal processes in planets, especially those located in relative isolation from other sizeable worlds. Such mechanisms might then apply to theoretical Planet X bodies, like Zecharia Sitchin's Nibiru (15), providing us with a distant world which is potentially habitable. The Dark Star solution (8) still seems the better possibility to me, but no longer can sceptics legitimately argue that the outer solar system is a dead pool. Where to Next for New Horizons? The New Horizons mission will continue to provide scientists with a staggering amount of data about the Pluto system over the next year or so, and has already proven itself as a great success in wowing the world. However, the second half of its mission, to conduct a flyby of a suitably large Kuiper Belt Object, is not going so well. Ground-based initiatives to target a suitable candidate KBO have not hit the jackpot (16): the more exciting prospects are not within range of New Horizon's potential cone of trajectories: the probe is capable of some limited manoeuvrability, which would preferably need to be instigated early into the next 15 years of its continuing mission (17). This area of the sky is a difficult zone to find distant, dim objects in. It lies in the Galactic Plane, providing the celestial equivalent of hunting for a needle in a haystack. It is also the general region of the sky where I suspect the Dark Star is located - its direct observation likely scuppered by similar issues (19). If a suitably sized KBO was not found within the required search area in the near future, the New Horizons probe might have been able to fall back on making some long-distant observations of several possible KBO candidates, each observed by the HST. In keeping with Pluto's colouration, all three of these KBOs are red in colour, "consistent with the expectation that most of the targets in the search area will be members of the 'Cold Classical population'" (20). As it turned out, Hubble came up trumps, locating several candidate objects early in its search. The prime candidate, 2014 MU69, named 'PT1' by the New Horizons team, is between 30 and 45km in diameter, has a circular orbit and also belongs to the 'Cold Classical population' in the Kuiper Belt (21). 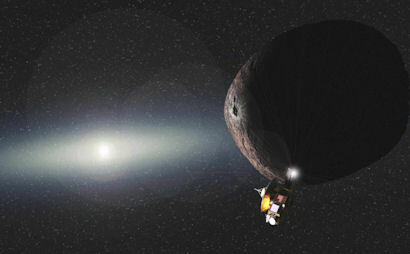 The rendezvous, if 2014 MU69 is chosen, would be in January 2019 at a distance of 43.4 AU. 2014 MU69 may be a pristine primordial solar system object, or it might be left-over debris from a cosmic collision (22). 11) A. Barr & G. Collins "Tectonic Activity on Pluto After the Charon-Forming Impact" 25th Mar 2014 http://arxiv.org/pdf/1403.6377v1.pdf? One might wonder what Zecharia Sitchin would have made of these developments. His translations and analysis of ancient Sumerian texts led him to propose that the grand Mesopotamian epics about their pantheon of gods were actually codified descriptions of cosmic events in the solar system (1). In other words, the science of the solar system, provided by the flesh-and-blood 'gods', or Anunnaki, who temporarily colonised the Earth, was handed down to the Sumerians in the form of myths and legends. In other words, in a format that they would understand and pass on. This is not such a leap as one might expect, as many of these texts (e.g the Babylonian 'Enuma Elish' (2)) are full of references to the heavens, stars and movement of the cosmic 'gods'. 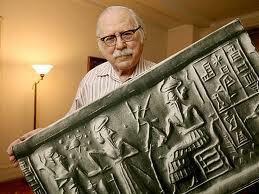 Sitchin discusses Pluto only briefly in his books. The Sumerians counted it as one of the planets proper (while we have shamefully degraded its status), and called it 'Gaga'. 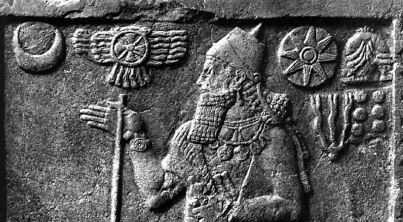 It was initially one of the moons of Saturn (Anshar), which was 'loosened from his course' by Marduk (the Dark Star/Nibiru) (3), "imparting to it some of Marduk's own orbital characteristics (such as a different orbital plane)" (4). This implies a tremendous degree of catastrophism to have shifted the planet that far away from its initial position; certainly enough to cause many of the properties of the Pluto system now observed. It's good to see that Dr Burgard has produced a further translation of these remarkable Temple Hymns; Part 2 of which was published in August 2014 and is now available to a German-speaking audience. I've written back to him hoping to glean some more detail - in English - and will continue to keeps readers updated with my progress regarding his important contribution to the understanding of ancient Mesopotamian texts. 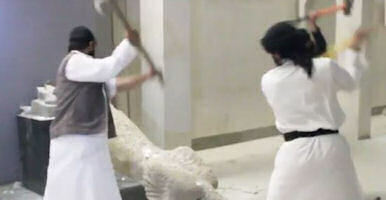 This trail of destruction followed on from the indiscriminate and wanton vandalism of the ancient Nineveh at ISIL-occupied Mosul, the museum of which was comprehensively ransacked (4). According to a local tribal source, Nimrud was looted of its valuables, then completely levelled to the ground (5). Justification for this cultural destruction takes the form of a distorted religious conviction that shrines and statues represent false idols, the worship of which must be stopped through the use of sledgehammers and bulldozers. It goes without saying that this is utter lunacy, reminiscent of the cultural cleansing of the Conquistadors in South and Meso-America. As far as the Banquet Stele of Assurnasirpal II goes, it remains safely housed in the British Museum (6), I'm happy to say. If any justification was ever needed for the removal of ancient artifacts from unstable parts of the world for cultural safe-keeping, then this is surely it. Yes, the British removed artifacts from Nineveh when they extensively excavated the site in the 19th and 20th centuries, and brought them back to London. Such activities by the European imperial powers of the time have often been criticised for effectively plundering then-occupied countries of their historical and cultural wealth. Of course, there is truth to this - but surely a welcome outcome has been the permanent relocation of these world treasures to more stable countries where they are safe from attack by these Islamofascist zealots? The Syrian World Heritage Site of Palmyra is now in IS-controlled territory. So far, 'only' statuary has been attacked by them (3), but it is likely only a matter of time before an incident in the on-going civil war there provokes their ire sufficiently to get the bulldozers rolling. The discovery of Kepler-452b has provided astronomers with the most Earth-like exoplanet yet, in the constellation Cygnus (1). At 1400 light years distance, we can know little about it at this point beyond its approximate mass, orbit and the properties of its parent star. But those facts are enough to get them buzzing (2), and put the media into a silly-season frenzy of speculation (3). At about five times the mass of the Earth, Kepler-452b is most likely a rocky world 150% the size of Earth. 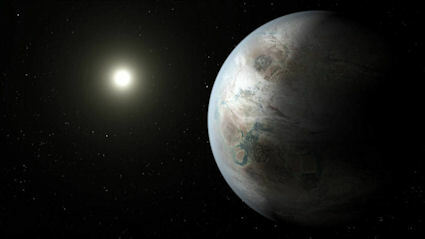 It's gravity would be considerable, its true, but it's the orbit within its star's habitable zone which excites astronomers (its year is 385 days), combined with the fact that its Sun-like star is six billion years old: a significant period of time which potentially allows for the evolution of advanced life, all other things being equal. It's natural for us to seek planets exactly like our own out there, hoping to discovery life elsewhere. But it's not necessary to do so: Habitable planets are as likely to be found around red dwarfs, brown dwarfs, or even as moons orbiting gas giants. Far from narrowing our search criteria, we should expect to find life of some form pretty much everywhere. The question is whether our catastrophe-prone universe really gives it a chance to get going sufficiently to look anything like us. This latest crop circle has second sun overtones written all over it. It is of a Native Indian Thunderbird. My interpretation: Sol above the thunderbird's head. The thunderbird's head is a circle and cross (inside). Classic wing-like appearance. I agree entirely, and there has already been plenty of speculation about the various influences which have gone into this artistic creation on the fields of Wiltshire (3) . There are certainly Egyptian elements to this, in particular the solar disk above the bird's head, reminiscent of the ancient Egyptian god Horus. 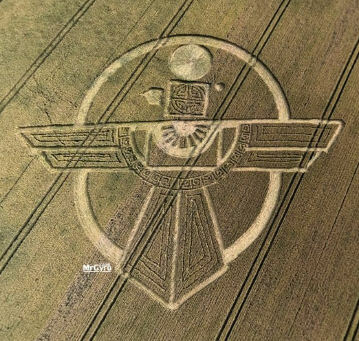 Additionally, the way that the bird is circumscribed by an (in this case imperfect) background circle is suggestive of Mesopotamian Winged Disks, for example those of the Zoroastrian god Ahura Mazda, or the Assyrian gods Ashur and Shamash. Indeed, one could call this a bit of a 'Sha-mash-up'. Very beautiful though. Hats off to the guys who created this outstanding artwork. I went to see fusion jazz guitarist Al Di Meola play in rural Switzerland last month, with my wife, one of my Swiss cousins and her husband. he was playing at the Postplatz jazz festival in picturesque Appenzell. I got the chance to meet Al backstage, which was quite a big moment for me, as I've been listening to his music since I was a student back in the 80s. He was impressed that we had traveled that far to attend the gig, and joked that they might be playing at Ronnie Scott's in London later in the year, which would have saved the trouble and expense. Wry smiles all round. He's a very cool guy. I had hoped that he would be doing an electric set, but the intimate yet stunning venue (the historic Kunsthalle in Appenzell) was clearly orientated around acoustic music. Al was joined by a superb acoustic guitarist, from the US, whom I also had the opportunity to chat with, but whose name unfortunately now escapes me. The acoustic-orientated venue allowed Al and his band to play a lot of material from his new album 'Elysium', which is, I have to admit, quite challenging fusion jazz. I've been listening to it a lot recently and it has grown on me steadily over time. My cousin and her husband may have found it a little overwhelming as a music form, but if they were they were way too polite to say anything. At least, not in English! I'm glad to see Al recognised with a much-deserved 2015 Festival International de Jazz de Montreal Miles Davis award this summer. I hope he continues to create his remarkable, innovative music for many years to come!